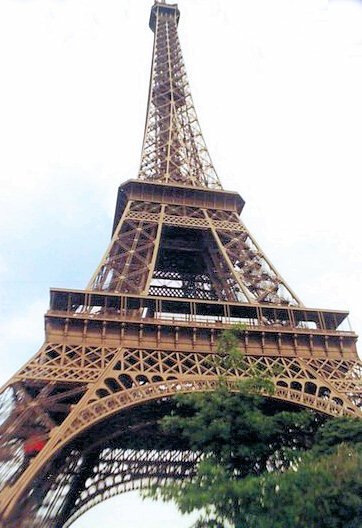 With blue skies and mild April weather, romantic “Paris in the Springtime” was at its best for the 21st annual congress of the European Association of Urology, despite a political background of student demonstrations and strikes at the beginning of the week. The EAU annual congress, held for the second time in its history in Paris, was a great success with a record number of over 11,700 participants from around the world. 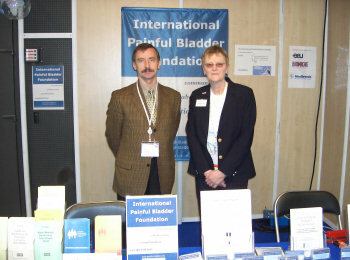 This congress was an important occasion for the International Painful Bladder Foundation since we were in effect launching the new name in urological circles. Our booth proved a great success and was visited by innumerable doctors. All our material – down to the last CD Rom – was gratefully taken away by the urologists and is now hopefully being digested from one end of the globe to the other. We have gained an excellent reputation for providing up-to-date information and many of the doctors came along to our booth for the latest version of our material. We would like to emphasise that this material is all available on this website. Furthermore, hundreds of delegates specially requested to receive our international email newsletter (also posted on this website) so as to be kept updated with the latest developments in the world of international PBS/IC. The urologists specifically stated to us time and time again that they were very happy about the change of name. They all felt that the name Painful Bladder is clearly understood by everyone worldwide and allows for any changes in terminology that may take place in future years. When we spoke to IPBF medical advisory board member, Dr J.L. Campos from Mexico, he told us that when he asks doctors in Mexico if they have IC patients, many of them shake their heads and say none at all. However, if he asks them whether they have patients with a painful bladder, there is immediate recognition of the term and they say yes indeed, they have several patients. Also over from Mexico was board member Florentina Ferreyra, President of the PBS/IC and urogynaecological patient support group in Mexico and contact person for Spanish-speakers not only throughout Latin America but also worldwide. There is now a rapidly increasing interest in female urology and PBS/IC in Mexico that is radiating to all other Latin American countries. This once again underlines the important role played by patient support groups in raising awareness. A painful bladder symposium is to be held in Mexico in late May with Robert Moldwin MD from the USA as key international speaker. Professor Andrey Zaitcev from Moscow State Medical University presented us with a copy of the book in Russian entitled: “Diagnosis and treatment of interstitial cystitis in women”, authored by O.B. Loran MD, A.W. Zaitcev MD and W.S. Lipsky MD. There is an immense amount of interest in PBS/IC in Russia and much interesting work is taking place there (see posters below). This work is also being energetically and enthusiastically promoted by Professor D. Pushkar, chairman of the department of urology at Moscow State Medical University. We are therefore now happy to have an IPBF patient leaflet on PBS/IC in Russian and a Russian language toilet card, both to be found on this website. Much emphasis was seen in the EAU scientific programme on neuro-urology and female urology. Steady progress is being made in the field of painful bladder and this will hopefully lead to new more focused therapies in the years ahead. Every endeavour is now being made to standardise terminology, definitions and procedures and gradually to work towards new internationally accepted criteria for PBS/IC. This will help to facilitate more meaningful studies. 383. Botulinum A Toxin intravesical injections in the treatment of painful bladder syndrome: A pilot study. Giannantoni A, Costantini E, Di Stasi S, Tascini M, Santaniello F, Del Zingaro M, Porena M.
In this Italian study, botulinum A toxin was injected submucosally into the trigone and bladder floor in 14 patients. A significant improvement was found in daytime and night-time frequency, average Visual Analog Scale and cystometric bladder capacity at both 1 and 3 months. No systemic side effects were detected during or after treatment. The results of the study indicated that Botox™ is an effective short-term treatment, reducing bladder pain and frequency. However, problems in emptying the bladder were experienced by 40% of the patients. 799. Intravesical Botulinum A Toxin (Botox™) – does it have a role in the management of interstitial cystitis? While intravesical Botulinum A toxin has been used successfully for neuropathic and idiopathic detrusor overactivity, trials with interstitial cystitis patients are still relatively in their infancy. This study involved 13 patients with IC and 13 patients with idiopathic detrusor overactivity. The Botox™ was injected into different parts of the bladder but not the trigone. In the IC group, only 1 patient experienced complete relief of symptoms, although 3 had some improvement in frequency. Treatment mainly had no effect on the pain of the IC patients. Three patients actually experienced an exacerbation of the pain following treatment. Three patients suffered retention. In the idiopathic detrusor overactivity group, treatment was successful in 11 out of 13. However 4 patients suffered retention. The retention problems lasted until the effect of the Botox™ had worn off (6-7 months). It was concluded that treatment with botulinum toxin A is markedly less successful in IC patients and that it has no role in the treatment of pelvic pain. However, during the poster discussion the authors wondered whether injections into the trigone might have been more effective. 683. Analysis of long-term pelvic floor electrostimulation therapy for interstitial cystitis. Parsons M, De Jong P, Radziszewski P, Peter D, Borkowski A, Cervigni M, Cardozo L, Farnsworth B, Nordling J, Groen J, Bosch J.L.H., Chapple C, O’Connell H, Anna R, Nissenkorn I. This multi-centre study was aimed at evaluating the long-term safety and efficacy of an implantable electrostimulation device (Miniaturo™-I, BioControl Medical, Israel) in female patients suffering from bladder pain and discomfort and voiding dysfunctions associated with Interstitial Cystitis. The patients first underwent external test electrostimulation connected to a stimulation lead inserted in the pelvic floor. If this was successful, it was followed by implantation of a power generator in the lower abdomen connected to a stimulation lead inserted in the urethral sphincter region. Forty-five out of fifty-seven patients completed an average follow-up of 18 months and showed a considerable improvement in IC symptoms and quality of life. It was concluded that pelvic floor electric stimulation is an effective and lasting method of treating IC patients. 686. Use of Ho: YAG laser in the treatment of patients with recurrent and interstitial cystitis. Zaitcev A, Pushkar D, Diyakov V, Galchikov I. This study from Moscow examined the efficacy of endovesical ablation with Ho:YAG laser under general anaesthesia in patients with different types of chronic cystitis. No adverse effects were observed. Frequency decreased in all responders and there was an improvement in nocturia, urgency and pain. In 4 patients with Hunner’s ulcers, symptoms recurred within an average of 9.2 weeks. Repeated laser treatment led to sustained improvement in symptoms. The researchers concluded that Ho:YAG laser endovesical ablation of urothelium areas with pronounced proliferative changes and/or the presence of Hunner’s ulcers is an effective additional method of treating recurrent cystitis. Laser ablation of Hunner’s ulcer seems to be an excellent method of treating this type of interstitial cystitis and led to a significant reduction of symptoms and improvement in the quality of life of the patients. Chronic pelvic pain syndromes (CPPS) with special focus on chronic prostatitis (CP) and painful bladder syndrome/interstitial cystitis (PBS/IC). Chaired by J. Nordling. Presenters: J. Nordling, M. Fall, J-J. Wyndaele. This course was very well-attended and can also be followed on the EAU webcasts now available on the EAU website (see below). A report on this course by professors Nordling, Fall and Wyndaele, as published in the EAU congress newsletter, is also available courtesy of Biermann Verlag GmbH, the EAU and the authors. Please click <here>. Many of the presentations and courses from the EAU Congress 2006 are available on the EAU website for those who were unable to attend the congress or who wish to refresh their memory.